When I was little I used to love when my mom would make english muffin pizzas. They always remind me of my childhood. It's been ages since I have had one and I was in search of something quick and easy for dinner tonight since I have a busy day planned. English Muffin Pizzas seemed perfect. 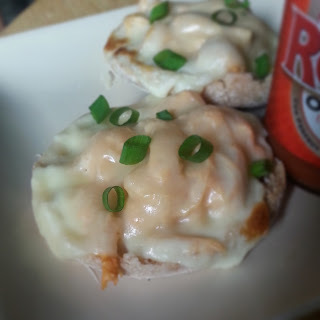 Of course being the Buffalo Chicken obsessed person that I am, I decided on Buffalo Chicken English Muffin Pizzas and made a regular one of my toddler. They were delicious! Preheat broiler. Slice English muffins in half and lay cut side up on a cookie sheet. Combine sour cream and ranch seasoning. Spread 1/2 tbsp ranch sour cream on each muffin half. Combine shredded chicken and buffalo sauce in a small bowl. Divide chicken mixture evenly among the muffins. Top each with one slice mozzarella. Place under broiler for 5 minutes or until cheese is lightly browned and bubbly. Top with green onions if desired. Enjoy! Yay! We used to love English Muffin pizzas as children too!! I've completely forgotten about them until now. THanks for bringing back the memories and for contributing to Foodtastic Friday!